^ 鐵路包括一趟由帕丁頓的慶祝之旅和600名股東和客人前一天在法靈頓的宴會 These platforms are now served by the Circle and Hammersmith & City lines. ^ Out-of-Station Interchanges (Microsoft Excel). Transport for London. 2016-01-02 [2016-08-28]. ^ Baker Street Station: Main Entrance Building and Metropolitan, Circle and Hammersmith & City line platforms (no. 1-6) including retaining wall to Approach Road. National Heritage List for England. English Heritage. （原始内容存档于2015-04-10）. ^ 3.0 3.1 3.2 3.3 3.4 Transport for London. 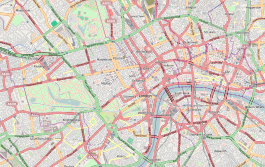 Standard Tube Map (PDF) (Map). Not to scale. Transport for London. January 2016. （原始内容存档 (PDF)于2015-01-03）. ^ 4.0 4.1 4.2 4.3 Rose, Douglas. The London Underground, A Diagrammatic History. London: Douglas Rose/Capital Transport. 1999. ISBN 978-1-85414-219-1. ^ Ian, Jones. 76. The original platforms at Baker Street. 150 Great Things About the Underground. 2013-01-06 [2015-04-10]. （原始内容存档于2015-04-10）. ^ Tube Stations that only have escalators. Tube Facts and Figures. Geofftech. [2015-04-10]. （原始内容存档于2015-04-03）. ^ London Underground: 150 fascinating Tube facts. Telegraph. 2013-01-09 [2015-04-10]. （原始内容存档于2015-04-10）. ^ Stations that it takes the longest to travel between. Tube Facts and Figures. Geofftech. [2015-04-10]. （原始内容存档于2015-04-03）. ^ Reid, T.R. Sherlock Holmes honored with statue near fictional London home. The Washington Post. 1999-09-22 [2013-01-06]. ^ TfL's Transport Portfolio Executive Report for the London 2012 Olympic Games and Paralympic Games – Quarter 2 2007/08 (PDF). TfL. 2008. （原始内容存档 (PDF)于2012-04-25）. ^ Accessible Transport Strategy for the London 2012 Olympic and Paralympic Games (PDF). London 2012: 31. May 2008. （原始内容 (PDF)存档于2008-11-21）. ^ Step-free access Baker Street station (PDF). TfL. September 2008. （原始内容存档 (PDF)于2013-08-14）. ^ Planning – Application Summary 08/08647/FULL. Westminster City Council. 2008-10-01. （原始内容存档于2013-08-14）. ^ TfL sets out £9.2bn 2009/2010 budget to deliver major improvements this year (新闻稿). TfL. 2009-03-31. （原始内容存档于2012-01-19）. ^ 'S' stock making its mark. Modern Railways (London). December 2010: 46. ^ Total Population. A Vision of Britain Through Time. University of Portsmouth/Jisc. 2009 [2015-12-13]. ^ Metropolitan Railway Termini. The Times (19277). 1846-07-01: 6 [2015-12-13]. .
^ Grand Central Railway Terminus. The Times (19234). 1846-05-12: 8 [2015-12-13]. .
^ 22.0 22.1 22.2 Day & Reed 2008, p. 9. ^ No. 21386. London Gazette. 1852-11-30: 3480 [2012-04-21]. ^ 25.0 25.1 25.2 "Fowler's Ghost" 1962, p. 299. ^ No. 21497. London Gazette. 1853-11-25: 3403–3405 [2012-04-21]. ^ No. 21581. London Gazette. 1854-08-11: 2465–2466 [2012-04-21]. ^ Day & Reed 2008, p. 10. ^ Wolmar 2004, p. 39. ^ No. 22529. London Gazette. 1861-07-12: 2871–2872 [2012-05-05]. ^ No. 22537. London Gazette. 1861-08-09: 3314–3315 [2012-05-05]. ^ 41.0 41.1 41.2 Feather, Clive. Metropolitan line. Clive's Underground Line Guides. [2015-04-10]. （原始内容存档于2015-04-06）. ^ 44.0 44.1 Wolmar 2004, pp. 66–67. ^ 45.0 45.1 Jackson 1986, p. 38. ^ No. 22532. London Gazette. 1861-07-23: 2997–2998 [2016-02-06]. ^ 47.0 47.1 Jackson 1986, pp. 39–40. ^ 48.0 48.1 Jackson 1986, pp. 38–39. ^ 49.0 49.1 49.2 49.3 49.4 Rose 2007. ^ 50.0 50.1 Day & Reed 2008, p. 18. ^ Day & Reed 2008, p. 20. ^ 57.0 57.1 No. 26225. London Gazette. 1891-11-20: 6145–6147 [2015-07-15]. ^ No. 27218. London Gazette. 1900-08-07: 4857–4858 [2015-07-15]. ^ 63.0 63.1 Lee, Charles E. Jubilee of the Bakerloo Railway – 1. The Railway Magazine. March 1956: 149–156. ^ The Underground Electric Railways Company Of London (Limited). The Times. 1902-04-10, (36738): 12 [2015-10-25]. ^ Railway And Other Companies – Baker Street and Waterloo Railway. The Times. 1904-02-17, (37319): 14 [2015-07-15]. ^ 67.0 67.1 Wolmar 2005, p. 173. ^ Horne 2001, p. 17. ^ 69.0 69.1 Feather, Clive. Bakerloo line. Clive's Underground Line Guides. [2015-07-10]. （原始内容存档于2015-07-10）. ^ Horne, Mike. The Bakerloo Line: An Illustrated History. London: Capital Transport. 2001: 38. ISBN 1-85414-248-8. ^ Horne 2001, p. 48. ^ Feather, Clive. Bakerloo line. Clive's Underground Line Guides. [2015-04-10]. （原始内容存档于2015-04-02）. ^ Earnshaw, Alan. Trains in Trouble: Vol. 5. Penryn: Atlantic Books. 1989: 20. ISBN 0-906899-35-4. 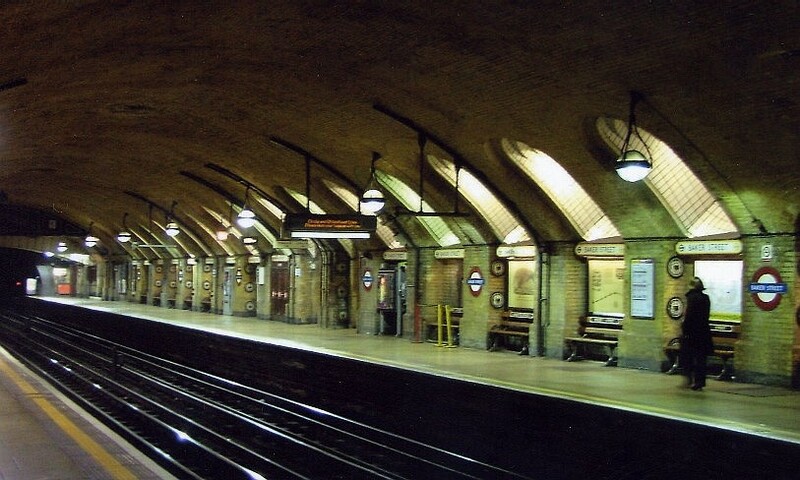 ^ History of Baker Street Tube Station. Jessica Higgins. （原始内容存档于2012-03-04）. ^ Nick, Cooper. Attacks on the London Underground. The Underground at War. 2006-06-05. （原始内容存档于2010-04-23）. ^ 78.0 78.1 Feather, Clive. Circle line. Clive's Underground Line Guides. 2014-12-13 [2016-02-13]. （原始内容存档于2016-02-13）. ^ Circle line timetable: From Baker Street Underground Station to Great Portland Street Underground Station. Transport for London. [2016-02-13]. （原始内容存档于2016-02-13）. ^ Circle line timetable: From Baker Street Underground Station to Edgware Road (Circle Line) Underground Station (anti-clockwise). Transport for London. [2016-02-13]. （原始内容存档于2016-02-13）. ^ 82.0 82.1 82.2 Feather, Clive. Hammersmith & City line. Clive's Undeground Line Guides. 2015-10-26 [2016-05-02]. ^ 83.0 83.1 Day buses from Baker Street and Marylebone (PDF). 2013-08-31 [2015-03-14]. ^ 84.0 84.1 Night buses from Baker Street and Marylebone (PDF). 2013-08-31 [2015-03-14]. Badsey-Ellis, Antony. London's Lost Tube Schemes. Capital Transport. 2005. ISBN 185414-293-3. Day, John R.; Reed, John. The Story of London's Underground 10th. Capital Transport. 2008 . ISBN 978-1-85414-316-7. "Fowler's Ghost". Cooke, B.W.C, 编. Railway connections at King's Cross (part one). The Railway Magazine (Tothill Press). May 1962, 108 (733). Green, Oliver. The London Underground: An illustrated history. Ian Allan. 1987. ISBN 0-7110-1720-4. Jackson, Alan. London's Metropolitan Railway. David & Charles. 1986. ISBN 0-7153-8839-8. Lee, Charles E. The Metropolitan District Railway. The Oakwood Press. 1956. ASIN B0000CJGHS. Rose, Douglas. The London Underground: A Diagrammatic History 8th. Capital Transport. December 2007 . ISBN 978-1-85414-315-0. Simpson, Bill. A History of the Metropolitan Railway. Volume 1: The Circle and Extended Lines to Rickmansworth.. Lamplight Publications. 2003. ISBN 1-899246-07-X. Walford, Edward. New and Old London: Volume 5. British History Online. 1878 [2012-07-03]. Wolmar, Christian. The Subterranean Railway: how the London Underground was built and how it changed the city forever. Atlantic. 2004. ISBN 1-84354-023-1. As shown in 1863. Science and Society. As shown in 2004. Rail Fan Europe. (restoration) Baker Street. Rail Fan Europe. Photograph of the Jubilee line platform at Baker Street. Tube Photos. Baker Street and Waterloo Railway entrance, demolished in 1964. London Transport Museum.